Druids were priests of an ancient Celtic * religious order. Powerful figures in the Celtic world, they served not only as religious leaders but also as teachers, judges, advisers, soothsayers, healers, and poets. The Druids held both religious and political power, leading to some blurring of the line between the spiritual and historical worlds. Caesar's Account. The earliest records of the Druids date back to the 200s B . C . Various ancient Greek and Roman writers described the beliefs and practices of the Celtic priests, and Welsh and Gaelic poetry also provided some details. However, more complete information about the Druids comes from the writings of Julius Caesar (ca. 100-44 B . C .), the Roman general and statesman. In his book The Gallic Wars, Caesar explained that there were two leading classes in Celtic society: the knights or warriors and the Druids. According to Caesar, the Druids did not have to perform manual labor, serve in the military, or pay taxes. Instead, the members of this learned class devoted their lives to leading religious worship and taking charge of human sacrifices. Caesar reported that the Druids were highly respected and called on for advice and instruction. They also served as judges for most public and private disputes, from major and minor crimes to arguments about money and property. Every year, the Druids gathered at a sacred place in the territory of the Carnutes, regarded as the center of Gaul. There they settled legal matters and made decisions about awards and punishments. Disobeying the Druids' rulings led to excommunication—expulsion from the order—which was the most severe punishment. The Druids' Teachings. The Druids believed in a supreme god, whom they called Be' al, meaning "the source of all beings." The symbol of this supreme being was fire. But the Druids also worshiped many lesser gods. Druids, priests of an ancient Celtic order, served as both religious and political leaders. The Druids taught that the human soul was immortal and that, upon death, it passed into the body of a newborn child. According to Caesar, such teaching was intended to make warriors less afraid of dying and thus increase their courage when they went into battle. Rituals and Practices. The early Druids regarded the oak tree as sacred and carried out their religious rituals in oak forests. In fact, the name Druid means "knowing the oak tree" in Celtic. The mistletoe, a plant that often grows on oak trees, also had an important role in the religion. According to the ancient Roman writer Pliny, Druids worshiped the mistletoe because they believed it had dropped from heaven and offered a sign that the oak tree upon which it grew had been selected by their god. Furthermore, the Druids associated the mistletoe with healing powers. Details of Druid ceremonies are few. However, Pliny did describe a fertility ritual in which a Druid clad in a white robe climbed an oak tree and used a golden sickle to slice off a mistletoe branch. The mistletoe fell onto a white cloak that had been placed below. Then the Druids sacrificed two white bulls, and a feast followed. The symbolism of this ceremony is not entirely understood, although the Druids seemed to associate white with purity. Reported in much greater detail was the practice of human sacrifice. The Druids believed that human sacrifices were necessary to win their god's favor. If illness, war, or some other crisis threatened, a number of people would be assembled, placed in wicker containers, and burned alive. Usually these individuals were criminals. Druids in Myth and Legend. The Druids' powerful central role in religion and society helped earn them a place in mythology. It was believed that the Druids had strange and magical powers and could foretell the future. Some reports described how the Druids would stab some of their sacrificial victims and look for omens by observing the flow of blood or examining the victims' insides. It was also said that the Druids used human sacrifice and magic rituals as a means of controlling supernatural forces and ensuring prosperity and success. 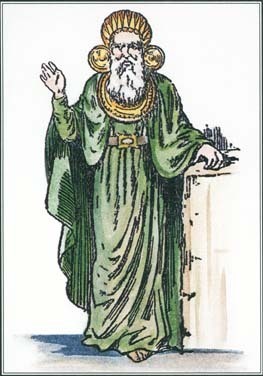 In early Celtic literature, Druids were frequently represented as prophets and magicians as well as influential royal advisers. Some accounts told how Druids could read minds and predict future events, while a few went even farther, characterizing Druids as "shape-shifters" who could take the form of birds or women. Some stories described the Druids as using their magic for evil, for example, turning people into animals. Druids made frequent appearances in early Irish mythology, notably in the four groups of traditional tales. A Druid who lived in the household of King Conchobhar of Ulster sometimes had more power than the king himself because of his ability to predict the future. The Irish hero Finn was raised by a Druid. Throughout the myths, Druids used their powers of prophecy and magic both for good and for evil. The image of the Druids changed over the centuries. By the 1700s, Druids as presented in literature had lost much of their connection with the ancient religious order. Some English writers even claimed that the Druids were descendants of the biblical Noah. Others said that the Druids were one of the ten lost tribes of Israel. See also Celtic Mythology; Finn .